Looking for man with a van in Reading? Simply enter your moving details below and get a free, no obligation quote in minutes! 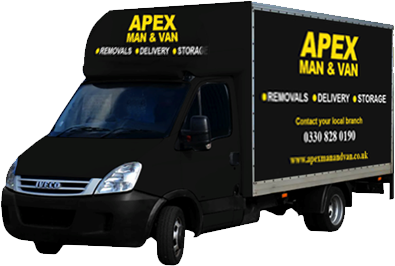 When you need a Reading man and van service, Apex is here to help. We pride ourselves on being the best in the business, providing domestic and business customers man with a van service that they can call on when they need it. Our customers highly recommend us and you can read our reviews to get a sense of how valued our service is. We are highly competitive when it comes to man and van services in Reading, and offer transparent pricing without any hidden surprises or extras! When we offer a price to our customer, that is the price that you’ll pay. We also offer free quotes – simply call us to discuss your job and we will be delighted to assist. Our team is here to help with any kind of man and van service that you need in the Reading and Berkshire area. Looking for someone to pick up that sofa set you bought from eBay? Need help collecting a bulk order from IKEA, or help to transfer the contents of your student flat into storage for the summer? Whatever your needs, we offer quality, insured and highly trained movers in Reading at a great price. Our team are highly trained and fully insured for your total peace of mind. This means that you can sit back and relax, knowing that we are taking care of all of your possessions, your home and many people on the site when we are carrying out our service. Our team will bring all necessary moving equipment and can also provide boxes and other materials for you to help pack as required. We operate 7 days a week and work flexible hours around your needs. This means that when you need a man with a van Reading wide, we are here to book your job to suit your schedule. We also serve the whole of Reading and can extend our services to nearby areas where required. Simply get in touch. For a free and no-obligation quote, please contact our helpful team today who will be happy to give you a fixed and free price, book in your job and provide any guidance that you might need.